~* West End Designs Journal *~: The Post In Which I Model. The Post In Which I Model. 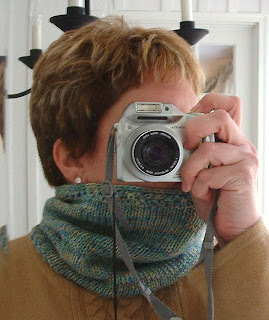 I am slowly getting around to showing you my knitting that I have been doing. This project was my "take along" project in my bag because it was really basic but I LOVE the results. I am definitely making another. The yarn form this project was very special. An internet friend sent me a great care package after Mark died. She is a knitter so she did what knitters do best, knit. I received the most stunning pair of hand knit socks!!! And yarn....and lots of other goodies too!! Thank you Melanie!! The Gloria Cowl - as is. So the yarn is Oceanwind Knits. I LOVE it. It has a wonderful drape and is a dream to knit with. I definitely put this on my yarn wish list!! I cannot remember the colorway, but if I can find the band in my knitting basket, I will add it here!!! That's me, trying to take a picture. It's harder than you think! 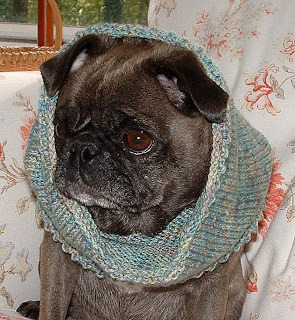 And naturally I had to put it on a pug! Gillie is the one that loves to wear "clothes". If her sweater is on, do NOT try to take it off. You can put fanch schmancy collars on her, and she will strut around the house like she was in a parade!! So I put it on her and told her she looked like she belonged on the set of "Dr. Zhivago". :) LOL!! Modifications: NONE - I followed the "formula" exactly!! 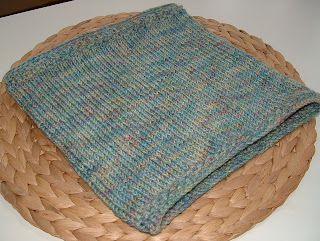 Notes: A really quick knit, and I will definitely make more of these, very warm and cushy!! This came out so gorgeous Kate!! It came out awesome!! I just love that company's yarn colors. So dreamy. Thank you again for introducing me to that yarn!!! And for the socks, and beads, and bag!!! :) That was such a special gift!